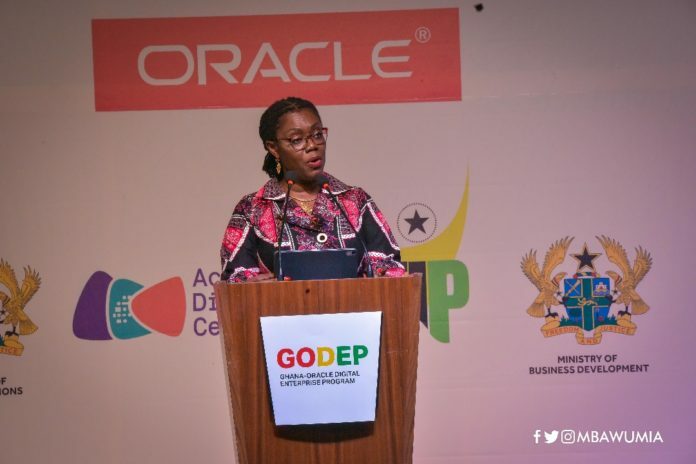 Communications Minister Ursula Owusu-Ekuful on Thursday reaffirmed government’s resolve to provide Ghana’s youth with critical IT skills to enable them succeed in the rapidly digitizing world of work. Speaking at the launch of the Ghana-Oracle Digital Enterprise Program (GODEP), Mrs Owusu-Ekuful observed that ICT has the potential of transforming every aspect of “our lives and promoting greater efficiency and productivity” and that the government, under President Akufo-Addo has demonstrated its resolve to harness and utilise technology to accelerate growth and build a resilient digital economy. The government, she said, is introducing modern technology to formalise the Ghanaian economy, promote digital inclusion, encourage the use of digital financial services by building interoperable systems and providing a light regulatory touch to foster innovation and growth of this sector, build a robust digital economy on the foundation of an e-ID system, digital property address system and a robust e-governance system to facilitate Government to Citizen, Business to Business, People to People communications and everything else in between. “E-justice, E-procurement, E- Health, E-education and everything E is gradually becoming an everyday reality in our lifetime but we need to provide our people especially our young ones with the critical IT skills to enable them succeed in the rapidly digitizing world of work,” Mrs Owusu-Ekuful said. To ensure the youth are given the need IT skills, Mrs Owusu-Ekuful stated the government through the Ministry of Communications has set up Technology and Innovation Hubs and mobile labs under the ICT Innovation module of the E-Transform Project, to nurture Tech Startups, promote digital entrepreneurship and create digital jobs for the youth. “In February 2018, as part of our youth employment initiative, the Senior Minister, launched the Digital Marketing and Entrepreneurship Program in this very centre. The pilot program took some 3000 youth through a 3-month all-expenses-paid training. 5000 youth living within the catchment area of the ADC, including women and persons with disability, who previously had no computer literacy have also been given basic computer literacy and digital marketing skills and secured ready jobs,” she stated. The Communications Ministry, she said is seeking partnerships to establish more tech parks and digital centers around the country and are also utilizing the network of community ICT centers to provide IT training to our farmers, fisherfolk, petty traders and students as well. Touching on the partnership with Oracle Global Start-up Ecosystem, she said it is a carefully calculated collaboration that fits neatly into the Government of Ghana’s digitization agenda and fulfills, in part, the government’s promise to employ innovative policies to nourish and grow the economy. “Oracle Global Start-up Ecosystem is a unique acceleration program for start-ups that puts the vast technology and business resources of Oracle behind emerging businesses to help them scale up and succeed. The global program, which serves start-ups at scale by enabling next-generation growth, business development, and drives cloud-based ingenuity for start-ups, consumers, and Oracle—creating a cycle of innovation. “Testimonies abound of the invaluable support this Oracle start-up program has afforded to many tech start-ups due to their genuine interest in such start-ups and the resources, support and security they afford through their mentoring program,” Mrs Owusu Ekuful said.